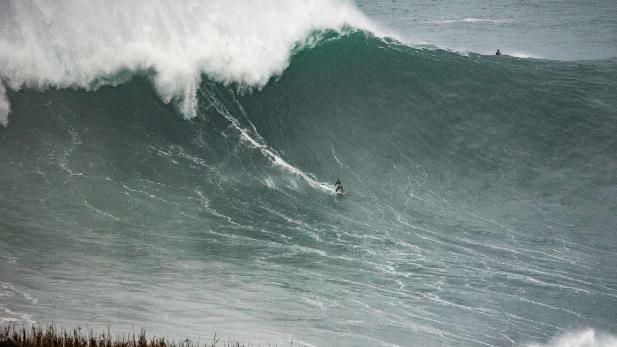 Reigning World Surf League (WSL) Big Wave Tour (BWT) Champion Grant ‘Twiggy’ Baker battled through three rounds of daunting six to nine metre (20-30 foot) waves to finish fifth in the Nazare Challenge at Praia de Norte in Portugal on Sunday. The second-ever BWT event at Nazaré ran over two days after dangerous conditions threatened the competitors following the opening heats on Saturday. Big Wave Tour Commissioner Mike Parsons, alongside the judging panel, rated conditions a Bronze coefficient, awarding the winner 10,000 points. 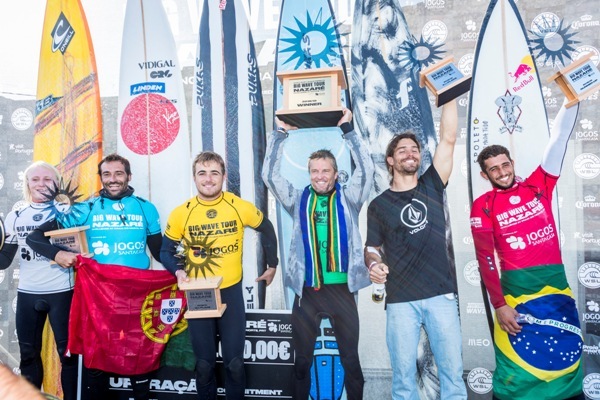 Competing in just his second BWT event, Chianca earned his first finals appearance and event win today after dominating the competitive 24-man field, made up of the world’s best male big wave surfers. The young Brazilian demonstrated command over Nazaré’s powerful waves and challenging white-water speeds to climb up to No. 5 on the Big Wave Tour rankings. Kemper’s runner-up finish moved him to No. 1 on the 2017 / 2018 BWT rankings, topping Lenny by 2,311 points. His recent success, both on the WSL Qualifying Series (QS) and Big Wave Tour, is a testament to his training and commitment to surfing. Not only does Kemper lead the BWT ranks, he recently won the Sunset Open Qualifying Series to put him in second place on the Hawaii/Tahiti Nui Regional QS rankings. Today’s win marked a first for Chianca, but also a last for his mentor Carlos Burlé (BRA) who pioneered big-wave surfing and rose to become the 2010 BWT Champion. Burlé retired last year but competed at this event as an end-of-career victory lap. 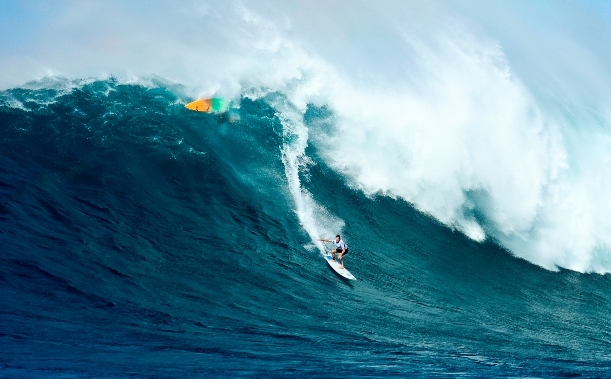 The fifty-year-old big wave surfer was eliminated yesterday in Round One Heat 2. The Mavericks Challenge still has the potential to run before the Big Wave Tour season closes on February 28, 2018. BWT officials will continue to monitor swell systems and weather patterns and will only call the event on when surf reaches the 30-foot-plus mark, mobilizing on 72 hours’ notice. LOS ANGELES, CA/USA (Tuesday, February 28, 2017) – With the conclusion of the 2016/2017 World Surf League (WSL) Big Wave Tour (BWT) today, Grant “Twiggy” Baker (ZAF) and Paige Alms (HAW) have claimed the WSL BWT men’s and women’s titles. Today’s achievement marks Baker’s second BWT title, after securing his first in 2013. Baker competed in all three events that ran on this year’s men’s BWT, kicking off his year-long lead with an emphatic victory at the Puerto Escondido Challenge in Mexico. The Durbanite then continued to carry the momentum to a strong showing at the Pe’ahi Challenge in Hawaii, where he captured the 3rd place trophy before solidifying his position atop the rankings after a Semifinal finish at the inaugural Nazaré Challenge in Portugal. Baker started his incredible career in 2003 with a Finals appearance at his first ever big wave event at Dungeons in South Africa. Since then, the South African has continued to push the limits of big wave surfing with numerous event wins at venues ranging from Maverick’s in California to Punta de Lobos in Chile and Punta Galea in the Basque Country of Spain. Additionally, Baker’s remarkable career is brimming with accolades from the Big Wave Awards, and today’s victory further cements his place in surfing history. Baker completed his season with 25,018 points on the year-end rankings, edging out the 20-year old Brazilian charger, Pedro Calado (BRA), by 3,075 points. Defending two-time BWT Champion Greg Long (USA) came in third place with a total of 22,921 points. On November 11, 2016, the first ever women’s WSL Big Wave Tour competition was held at the Pe’ahi Challenge. The historic event witnessed incredible performances as 12 individuals took to the water to compete for both the event win and the maiden Women’s Big Wave Champion Title. 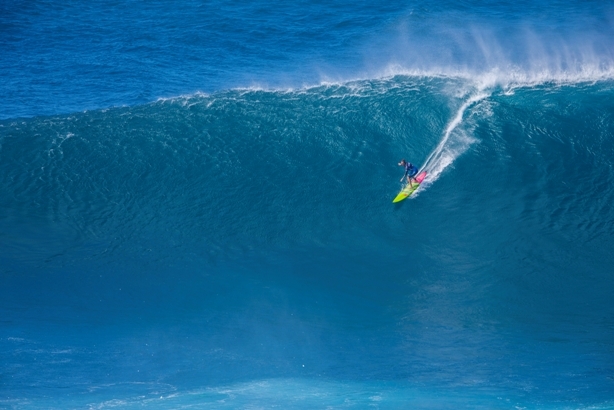 Alms made history on the world stage when she won the Pe’ahi Challenge to become the first ever Big Wave Women’s Champion. 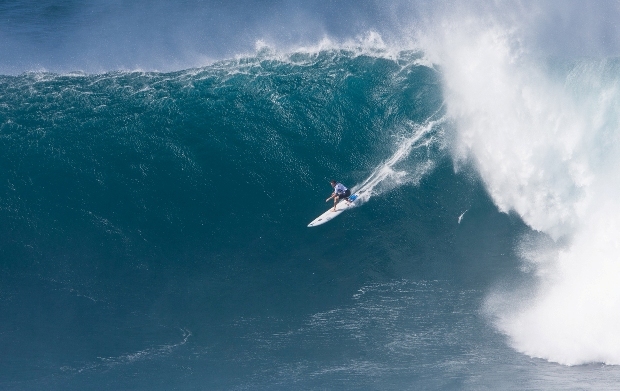 Alms, who lives on Maui, started charging big waves at the age of 15. Like most female big wave surfers, Alms’ career has been self-supported through juggling multiple jobs to fund her travel and training. Her commitment, hard work and passion is not only evidenced through her accolades, but predominantly through her undoubted elevation of big wave surfing. Organisers were delighted when all the conditions aligned for the first paddle-in contest at the notorious big wave break where a deep underwater canyon funnels and amplifies the gigantic swells as they approach the beach, producing surf which is more commonly ridden using jetskis to tow the surfers onto the waves. Baker started his campaign in the Heat 2 of Round 1 and confidently caught and rode a heat-high five waves to finish in second place behind Nic Lamb (USA) as the pair advanced to the semi-finals along with third placed Pedro Calado (BRA). In his semi, the South African fell on his first ride and then suffered an horrendous wipe-out when he was bounced off his board at the top of a huge wave and, unable to penetrate the water, skipped 13 metres down the face of the wave on his back before the lip landed on him. Recovering from the impact, Baker then spent more than 20 minutes clinging with all his strength onto a rescue sled behind a jetski as the pilot tried to get out to the lineup through countless massive waves. In a credit to his courage, fitness and tenacity, Baker was back in position with just five minutes remaining. In a late flurry, he caught and rode two more waves to move into fourth place in the heat. Although he did not advance to the final, the extra rides ensured he finished seventh instead of 11th overall in the event, earning an extra 2000 rankings points. With just one more event on the 2015/16 BWT schedule, at Todos Santos in Mexico, Baker is now 3,000 points ahead of his nearest rivals, Calado and reigning BWT champion Greg Long (USA), and the Durbanite is in line to add the a second BWT title to the one he clinched in the 2012/13 season. Jamie Mitchell (AUS) dominated the event from the outset, catching several of the biggest waves that came through and winning his Round 1 and Semi-final heats before coming from behind to overtake tour veteran Carlos Burle (BRA, 49) to clinch his first BWT event title. The12,500 points Mitchell earned rocketed the former lifeguard and world renowned prone and SUP paddle racer from 13th to fifth on the latest BWT rankings. The final opened with an exciting first exchange between Burle and newcomer Calado (BRA), Burle taking the nod and an early lead with a clean lefthander on his backhand that earned a 6.50. Lamb followed in dramatic fashion with two of the most horrific wipe-outs seen all season and local wildcard Joao De Macedo (PRT) struggled as well, air-dropping unsuccessfully into a monstrous set wave before falling at the bottom and being engulfed in a waterfall of churning white water. Halfway through the final, Mitchell committed to an incredibly late drop on a lefthander, grabbing the rail of his board to engage into a bottom turn before being eaten by a mountain of foam. Mitchell surfaced with his equipment and was rewarded with an excellent 8.67 for his effort, stealing the lead from Burle. The Australian quickly put a second score on the board to cement a lead that he held throughout the remainder of the heat. 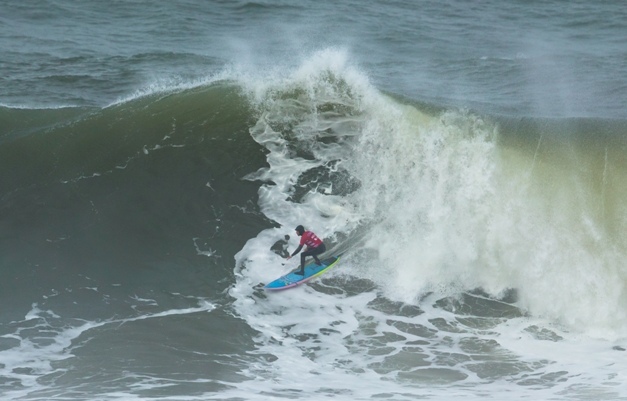 De Macedo was the giant killer of this event, eliminating reigning Big Wave Tour Champion Greg Long (USA) in the first round, as well as current BWT leader Baker and Aaron Gold (HAW) in the semis. De Macedo’s amazing run culminated with a third place in the final. 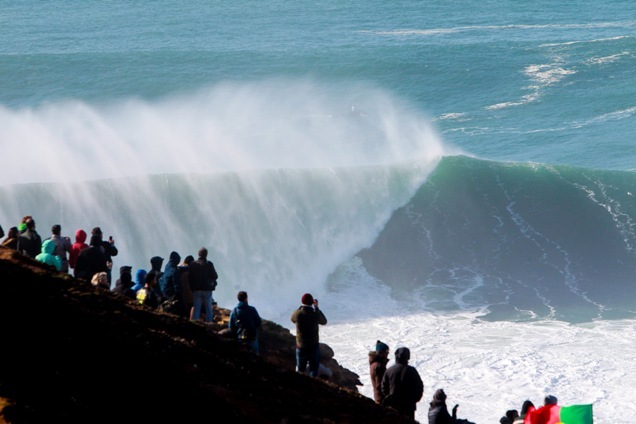 A capacity crowd of big-wave enthusiasts gathered around the landmark lighthouse on the cliffs overlooking the break to watch the event unfold in the biggest waves ever paddled into in Portugal. Highlights available at WorldSurfLeague.com and on the WSL App. The 2016/17 BWT season is divided into Southern Hemisphere and Northern Hemisphere components hosting three possible events within each. The Southern Hemisphere window ran from April 27 to August 31, 2016 with event options in Mexico, Chile and Peru. The Puerto Escondido Challenge was the only event to run and saw Baker take the win. The Northern Hemisphere window runs from October 15, 2016 to February 28, 2017 with event options in Portugal, Hawaii and Mexico. The Pe’ahi Challenge was the first event to run on Friday, November 11, and saw Billy Kemper (HAW) and Paige Alms (HAW) claim victory. NOTE: High resolution images and broadcast quality video footage are available on request for media outlets. South African big wave charger Grant ‘Twiggy’ Baker is mentally and physically prepared for the Nazaré Challenge, Stop No. 3 on the 2016/2017 WSL Big Wave Tour (BWT) schedule which has been given the Green Light to start in Portugal on Tuesday 20 December. Baker has been practising in the Northern Hemisphere since October and is full of confidence after placing third in the recent Pe’ahi Challenge in Hawaii and retaining his BWT rankings lead. “I’m feeling fit and healthy as I’ve been in California and Hawaii for two months now surfing most of the big swells and this has helped me be prepared mentally and physically for the event,” Baker explained. “I’ve been here (Nazaré) for a few days warming up and the wave is very similar to beach breaks I’ve surfed on the West coast of Africa and Ocean Beach in San Francisco, so I feel comfortable. Saying that, it looks like the event will run in larger conditions so I’m not to sure what to expect, but I’m confident in my boards which are specifically designed for Nazare by Pukas Surf here in Europe. With a series of major swells heading towards the region, all eyes will be on the world’s best big wave surfers as they take on the waves of Praia do Norte (North Beach), a break notorious for its powerful waves and dangerous white water speeds. 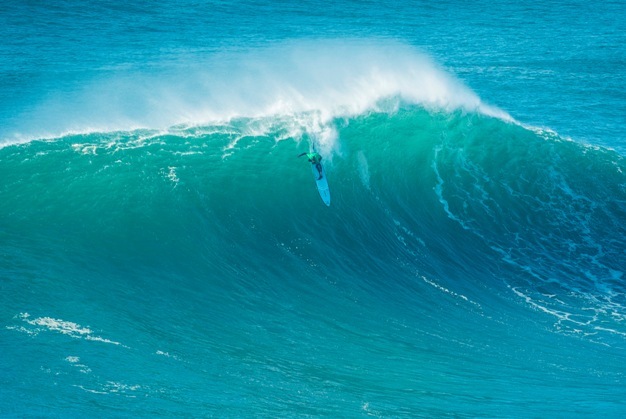 The highly-anticipated Nazaré Challenge is an all-new event on the WSL Big Wave Tour and will be the first paddle-in event to take place at the venue that put Portugal on the map as a big wave haven. The event will be contested by 24 of the best big wave surfers, led by BWT ratings leader Grant “Twiggy” Baker (ZAF), 2015/16 BWT Champion Greg Long (USA), as well as regional event wildcards Alex Botelho (PRT) and Andrew Cotton (GBR). Significant storm activity in the North Atlantic in the next few days will deliver a series of XL to possibly XXL swells for Nazaré for most of the week. The first of these swells, which will arrive on Tuesday, is currently expected to produce waves of 10-13 metre (30-40’) on the face, with the largest sets potentially hitting 15 metres (50’) if the storm behaves as forecast in the next couple days. A similar size swell looks possible for Thursday before fading Friday. Local wind will be variable for much of next week, although does look favourable Tuesday morning, Wednesday morning and potentially all of Thursday and Friday. While the competition is scheduled to start early in the morning Portugal time on Tuesday, December 20, organizers are also keeping the option open of competition days on Wednesday, December 21 and Thursday, December 22, should the local weather conditions call for it. 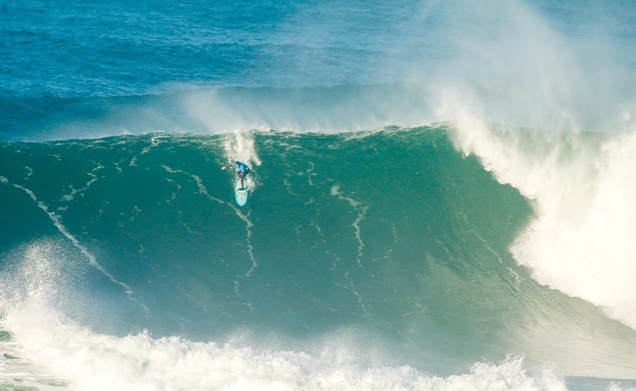 The total prize purse for the Nazaré Challenge is $100,000 (approx. R1.35 million). Baker, the 2013 BWT champion and winner of the Puerto Escondido Challenge in Mexico in June, stayed busy in the inconsistent rising swell in his Round 1 heat where he finished second to advance to the semi-finals. There the Durbanite again caught the first ride of the 50 minute encounter, but had to wait until just four minutes from the end before finding a backup ride that saw him grab third place and a berth in the one hour final. Maui local and defending Pe’ahi Challenge champion Billy Kemper (HAW) and Baker shared a wave to open up the final, with Baker getting the best of the exchange. Reigning and two-time BWT Champion Greg Long (USA) followed quickly on the second wave of the set and posted an excellent 8.83, which he backed up on one of the bigger waves of the day with another excellent ride for 8.93. Kemper pulled into a barrel at the halfway mark to earn the only perfect 10 point ride of the event, taking the lead from Long and pushing Baker into third place, despite an excellent 8-point ride from the South African for a late drop. A final attempt from Nic Lamb (USA) moved him up into fourth place over Pedro Calado (BRA) and Will Skudin (USA) who finished in fifth and sixth places respectively. Kemper held the lead through the remainder of the final and closed with a 9.07 for pulling into a deep pit which sealed his second consecutive win at Pe’ahi. The result sees Kemper move up nine places to No. 4 on the BWT rankings while Baker retains the ratings lead with only two possible events remaining on the 2016/17 season. Pe’ahi local Paige Alms (HAW) has become the first ever WSL Women’s Big Wave Tour Champion after taking a commanding victory in the final of the Pe’ahi Challenge. The world’s best female big wave surfers, including South Africa’s Tammy-Lee Smith (Salt Rock), made history as 12 individuals took to the water to compete in a WSL Big Wave Tour event for the first time ever and contest for the maiden women’s title in heavy conditions at the break aptly known as Jaws. The final saw Alms, Justine Dupont (FRA) and Felicity Palmateer (AUS) take to the water for a 60 minute match-up. Keala Kennelly (HAW), Emily Erickson (HAW) and Laura Enever (AUS) had also qualified for the final after placing in the top three in their respective Round 1 heats, but were unable to compete after sustaining injuries in the powerful surf. Dupont led the charge, opening her account with a 3.17 but Alms found an incredible wave and took off with perfect positioning to be rewarded with 6.00 and then added another impressive ride for a 7.83, one of the day’s top scores. Dupont tried to fight back but ended runner-up with Palmateer taking third place. Smith, who received a late call up as a wildcard for the event and was surfing on Maui for the first time, caught one wave as the wind affected waves made her Round 1 heat extremely challenging. But it wasn’t enough to advance to the final and she was eliminated from the competition. Results, images and video footage of every ride in the Pe’ahi Challenge can be found at WorldSurfLeague.com and on the WSL app. Grant ‘Twiggy’ Baker, the current rankings leader on the World Surf League (WSL) Big Wave Tour (BWT), and Women’s BWT debutant Tammy-Lee Smith, both from KZN, will be flying the South African flag in the Pe’ahi Challenge in Hawaii, which has been given the green-light to run later today. The call on when to get the first event in the Northern Hemisphere leg of the 2016 / 2017 BWT season underway will be made at 7pm South African time. Organisers are expected a powerful 5-7 metre (15-20 foot) swell with wave faces between 10 and 15 metres for the field of 24 men and 12 women the first ever Women’s BWT event. 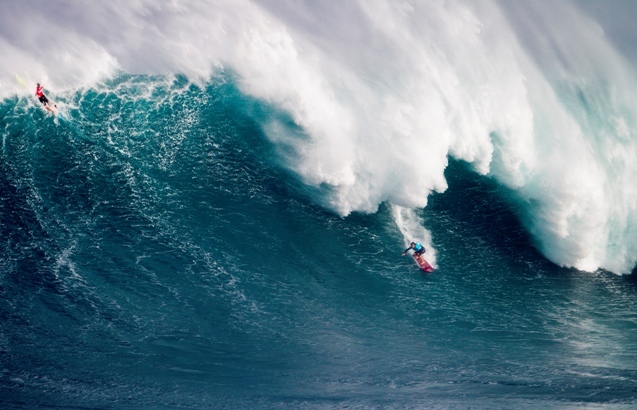 Baker missed the inaugural Pe’ahi Challenge in December last year, which has been called the best big wave event in history, due to an injured back and is looking forward to competing at the revered break colloquially known as ‘Jaws’ which produces some of the biggest rideable waves on the planet. “It’s going to be a great contest in the 15-20ft range with the swell out of the North and clean conditions which should make it a high performance big wave event with late drops, deep barrels and swooping turns,” said Baker on his arrival in Hawaii on Thursday after testing his equipment in the giant waves at Mavericks in California earlier in the week. “I am the current ratings leader but the field for Jaws is strong and to win in Hawaii is difficult, so I’m just here to enjoy myself, get some waves and do my best for South Africa,” Baker explained. The decision to include a women’s event at either the Pe’ahi or Todos Santos events this year resulted in Tammy-Lee Smith from Salt Rock being included on the alternate invitee list. However, the nature of how the calls are made for big wave events, where competitors are notified just 96 hours before the event start, led to a slew of withdrawals among the invitees and Smith has now been included in the field of 12 women as a wildcard. Smith is an experienced five year veteran of the WSL Women’s Qualifying Series campaigner who has previously reached the final of the women’s event at Pipeline in Hawaii. Having always enjoyed surfing in waves of consequence, she already has the right equipment for Jaws and had been in training for a trip to Hawaii in December after testing her skills in the massive waves at Sunset Reef in Cape Town. The call-up for the Pe’ahi challenge has seen Smith drop everything and fly halfway around the world, arriving in Hawaii yesterday. All the action from the Pe’ahi Challenge will be webcast LIVE on WorldSurfLeague.Com starting at 7pm South African time tonight. 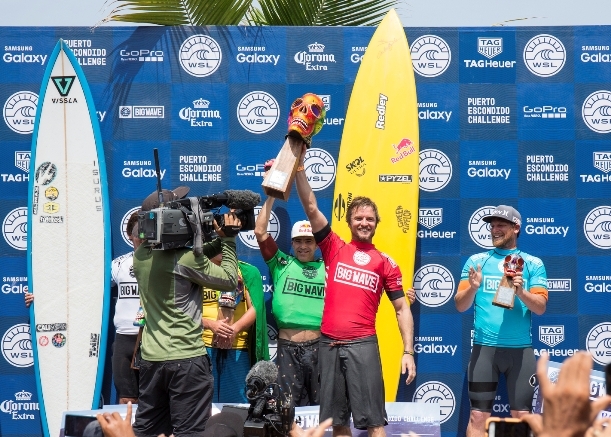 PUERTO ESCONDIDO, Oaxaca/Mexico (Saturday, June 25, 2016) – Grant “Twiggy” Baker (ZAF) claimed victory today at the Puerto Escondido Challenge, defeating a field of 24 of the world’s best big wave surfers in towering 6m – 10m (20-to-30 foot) surf off the coast of Mainland Mexico’s Puerto Escondido. Baker, 2013/14 BWT Champion, put on a stunning performance in Mexico, storming to victory in the Semifinals before his impressive showing in the Final. The South African showcased technical and precise surfing throughout the Final. Baker captured early control over the field and continued to solidify his lead with incredible rides. Baker locked in multiple excellent-range scores, but it was the perfect 10.00 awarded for escaping a massive tube that cemented his victory. Baker’s final combined score was an impressive 27.50 out of a possible 30. Baker came into the event as an injury wildcard and his winning performance will kick off his 2016/17 BWT Title campaign with 12,500 points and first place on the BWT rankings. Baker’s fellow finalists represented elite competitors of the big wave community, including Greg Long (USA), Pedro Calado (BRA), Carlos Burle (BRA), Will Skudin (USA) and Makuakai Rothman (HAW). Greg Long (USA), two-time BWT Champion, captured second place at the event. Long’s chances were in doubt during the Semifinals when he had yet to catch a wave with five minutes left in the hour-long heat, but his experience at Puerto Escondido enabled him to catch a single excellent-range wave at the last minute which was enough to put him through to the Final over other competitors with two lesser rides. Long’s runner up finish in the Final puts him in second place on the leaderboard and in position to defend his existing WSL Big Wave Title. Pedro Calado (BRA) charged throughout the contest to capture the third place position. The young Brazilian cemented his reputation as the best teenage big wave surfer in the world, demonstrating commitment and fearlessness as he charged through heavy barrels and dispatched top-seeded competitors. 2009/10 BWT Champion Carlos Burle (BRA) rode three waves in the Final for a 16.87 heat total and fourth place. Will Skudin (USA) finished in fifth place with a 12.97 heat total in the Final. Skudin, a native of Long Beach, New York, carries the torch for America’s East Coast onto the top ranks of the Big Wave Tour in 5th place on the leaderboard. Last year’s BWT runner-up and 2014/15 BWT Champion, Makuakai Rothman (HAW), suffered an injury twenty minutes into the Final and was not able to come back to the competition. Rothman charged through a deep, heavy barrel, but was wiped out by a powerful wall of water. Rothman was in fine form in Mexico for this event, winning both his Round 1 and Semifinal heats. Rothman will walk away with a 6th place finish. Local wildcards Jimel Corzo and Rogercin Ramirez (MEX) suffered Semifinal eliminations today after strong performances yesterday. Corzo put up a hard fight until the dying minutes of the heat, but could not close the 2.44 point gap required to advance. Ramirez caught two massive rides in the opening Semifinal heat, but his effort was not enough to make it through to the Final. Jamie Mitchell (AUS), who gained entry into the 2016/17 BWT as a WSL Big Wave Awards Performer of the Year nominee, suffered a Semifinal elimination today after a stunning Round 1 performance. Mitchell, who posted the best heat score of the event in Round 1 Heat 4, a near-perfect 29.03, was eliminated in his Semifinal against Rothman, Calado and Burle. 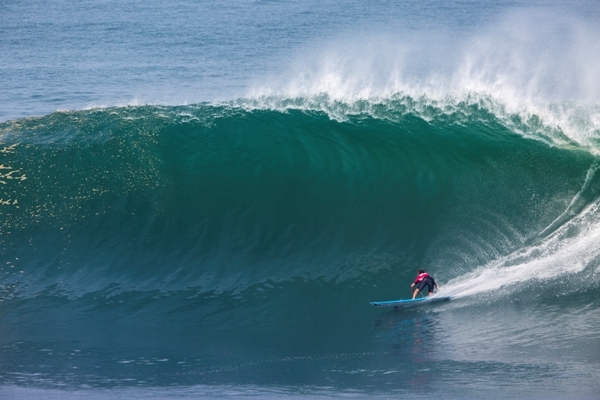 Two events, the Quiksilver Punta de Lobos Challenge in Chile and the Billabong Pico Alto Challenge Peru remain in the Southern Hemisphere window with potential to run, conditions permitting, before the August 31st close of the window. Highlights from the Puerto Escondido Challenge are available at WorldSurfLeague.com. Northern Hemisphere window runs from October 15, 2016 to February 27, 2017 with event options in Portugal, Hawaii and Mexico.